Praying BOLDLY. Praying DARINGLY. Believing God can do all we ask or imagine and is always listening. Warning: these prayers might just change your life! Asking God to reveal & remove the junk on the inside of us. 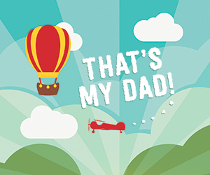 June 19 - "That's My Dad!" Join us this Father’s Day as we unpack the elements of Christian fatherhood. Pouring out our weaknesses and finding strength in God alone. Where do you think God might be sending you? How does this work? Join us this July 4th weekend for a family service that may just change the trajectory of your life!